Don’t have an hour and a half? No problem! My post is built so you don’t have to watch the video if you don’t have the time. If you'd like to watch me go rogue, just jump to the fifteen minute mark. Backstory: In case you haven’t heard of The Division, it is a cover-based shooter with RPG elements. Imagine if you will, the mechanics of Gears of War but with a leveling system, which has an effect on how much damage the player will do. The Dark Zone is the PvP (player vs. player) area of The Division. In the Dark Zone, the player is tasked with collecting loot by killing enemies, and then making their way over to an extraction zone to drop off their loot. This is because they have to “decontaminate” the loot before they can use it. When they have loot, a little yellow pouch appears on their backpack to notify other players they have some loot. Upon reaching the extraction zone, they can call in a helicopter that can take loot from four players at a time. The helicopter takes about ninety seconds to reach the players. During this time, the players will have to defend against waves of enemies who spawn in and attack them. Once the helicopter has arrived, the players will need to make their way to the helicopter and drop off their loot by holding a button for a few seconds to secure it. So, that’s the dark zone in a nutshell. Wait you said there was going to be PvP? If a player attacks another non-rogue player (does X damage), they go rogue for twenty seconds. When a player has gone rogue, their position is alerted to all other players within a certain distance. If a rogue player continues to harm other players their timer will increase. Rogue players cannot leave the Dark Zone until their timer has run out. When a rogue player is killed, their gear can be taken by anyone. Players who kill a rogue player DO NOT go rogue! I think the developers were attempting to create a version of the prisoner’s dilemma by creating this system. If A and B each betray the other, each of them will serve two years in prison. If A betrays B but B remains silent, A will be set free and B will serve three years in prison, and vice versa. If A and B both remain silent, both of them will serve only one year in prison on the lesser charge. If we take this into account when looking at The Division, we can see that much like both of the prisoners staying quiet, if players leave each other alone or even work together they will get something. Probably not the best thing for either of them but something nonetheless. If one player betrays the other and steals their loot, they have come out on top with more loot! And the other player comes out with nothing. Sadly, it is impossible for both players to betray one another because one will go rogue. The killed player won’t be able to do anything to the player that betrayed them, unless they can find them again after they respawn but before the rogue timer of the other player runs out. Went rogue… Didn’t end well. This brings me to the issue with the mechanic. The punishment for going rogue is fairly severe, with every other player hunting the rogue without fear, while the reward is completely random. When the criminal decides to betray his buddy, he is banking on the other player not betraying them first. The developers attempted to create a similar feeing by having the other players be the great equalizers. So if you betray someone, you’re going to have quite a few other people coming after you. While this does still give a light feeling of the dilemma, it’s like having the mafia waiting outside for the two guys, and if they only see one they know to kill him. And kill him they will. Another issue with this is, it’s a response. In the dilemma, the prisoners are separated and neither can make the decision with any influence from the others. In the Dark Zone, players can talk to one another, which already allows them to try and lie or work together. This is a pretty cool concept, but it turns the dilemma on its head. So now our prisoners are instead being questioned together, and they can talk to one another in private without the police watching, and are then given a chance later to give their final answer, while separated, to the police. In this case, players talk about not killing one another, then one can change their mind without saying anything, and kill the other player. So the player now has the mafia chasing them, not to mention the guy who he betrayed who got out of prison early on good behavior, as the player they killed can respawn nearby. I’d bet that nine times out of ten, players who go rogue with the intention of stealing other player’s gear don’t make it out alive. Side note: There are groups of trolls who like to kill other players but eventually even they get overrun. Not only do they not make it out alive, but they lose Dark Zone experience, Dark Zone funds and their own loot. As you can see I lost my loot, 823 credits, a Dark Zone Key and 667 XP. This brings me to the biggest issue with the Dark Zone Dilemma. There is no incentive to go rogue. Yes, you can kill a player and steal their loot. But even if you do, you have no idea what they have on them until they drop it, and more than often than not, the player is not going to have anything of value. Let me remind you this is a loot based RPG that means A LOT of weak items drop and only a few good ones do. So there is a high chance that when you do kill another player, they are going to drop something worthless. Because of this, the prisoner dilemma is absolutely trashed. If I’m a prisoner and the police give me the option to betray my buddy, but they say “Eh, instead of locking you up for three years, we’re only going to lock you up for one to three years, but most likely still three,” I might betray him. A chance is nice! Not amazing but nice. But let’s think about if they are asking me to betray a mob boss. So the boss will go to jail and I could get out a few years earlier, but I’ll spend the rest of my life running from the mob that is constantly trying to kill me. Let’s be honest, they are probably going to be waiting for me the day I get released. Why the hell would I betray them? This is the biggest problem with The Division’s Dark Zone. While I believe the Dark Zone was created with these really cool ideas in mind, the lack of rewards versus high risk is not worth it. This has created a very polite Dark Zone where no one bothers one another. And aside from trolls who decide to go rogue and really have no actual desire to extract, or purposely move into another player’s line of fire to get shot and make that player rogue, no one goes rogue. So, how do we fix this? We need to make it worth it to a player to go rogue. I think a system where the bag, which notifies other players you have gear, changes color based on the rarity of the loot inside will make players feel as if going rogue is worth it. If someone has a very rare item, like a purple rarity gun, change the bag purple. I feel like this will further increase tension on both sides and make players more likely to go rogue when another player has something really rare. While this could make for something like the end of The Departed, it would also make for some really intense firefights. Side note: for those who haven’t seen The Departed, SPOILERS! This is the ending! There is some blood. You’ve been warned! The second change I’d like to see would be to the punishment of the players who have gone rogue. Losing money, annoying but fine. Having a waypoint above their head that let’s other players easily hunt them down, fine. Losing experience and levels is not. If they must keep it, then let the player lose experience up until they would level down, and not lose any more experience or levels past that point. But I’d like to see them get rid of that punishment altogether. By the way, that same punishment happens to players who haven’t gone rogue. Get killed, lose experience. I’ve dropped entire levels from being killed a few times in a row. It’s insanely frustrating and makes you want to die even less, which further pushes me from wanting to go rogue because my chance of death increases exponentially. Remember, while rogue, everything is hunting you. I hope this enlightened you to how the prisoner’s dilemma, one of the most interesting game theory concepts, can go so wrong in a game. I hope you enjoyed this post and I’d love to hear what changes you think would make the players more likely to go rogue without breaking the game. I’ll be back next week with an update on the Gardens of Eden, the game I’m working on in my free time. Sherlock Holmes: The Case of the Unselectable Boots! In the process of making games, it is easy to overlook issues, which seem small, but by doing so the small issues can compound into something much larger. This is the case with Sherlock Holmes Crimes and Punishment. Today we are going to talk about the fun in this game. Where is it? What is it? And how did the developers accidentally bury the fun? Side note: As I mentioned from last week, I started to stream a little bit of the games I am going to write about. I have uploaded a full version of this stream to youtube if you have an hour and a half and you wish to watch the entire thing. It can be found here https://www.youtube.com/watch?v=Uo0xWtiZUH4 . If not, that’s not a problem as you can still enjoy this article without watching the stream. When you think of Sherlock Holmes, what do you think of first? Solving mysteries? Making deductions? Maybe you think of his hat and famous silhouette that is plastered to everything involving him? Regardless of what any one person may be thinking, we can agree that his name brings the thought of mysteries and solving cases. In Sherlock Holmes C&P, this is where the fun lies. The player is given a mystery to solve and they must explore a variety of environments to find clues to solve the mystery. Sherlock even has a “Sherlock Vision”, which will highlight details the inspectors may have missed. Notice how the footprints are highlighted and easier to see in Sherlock Vision mode. Additionally, he can question other people for information and make accurate assumptions about them based on their appearance. Ah ha! A rosary! She’s religious! But all this pales in comparison to making connections. In Sherlock Holmes C&P, there is an interesting system resembling brain synapses that connect pieces of the mystery together. This screen shot is from a little bit later in the game so you can get a better idea as to how they connect. 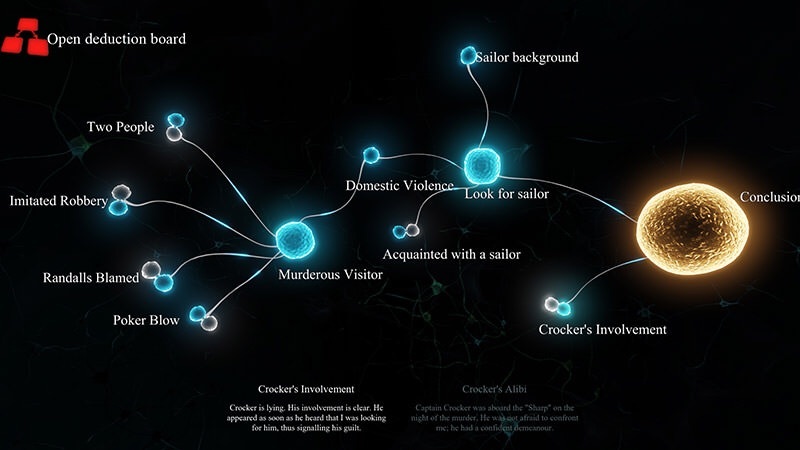 Players can select these and make connections, which will then influence their choices in the mystery. The player can select two concepts and try to link them together. After linking them sometimes they will be given the option of more than one possible conclusion to search for. By using these mechanics, players are able to make connections and solve the case. This is where the fun lays, and my god; it is a lot of fun. But sadly all too often in games we can see excellent mechanics like these buried under subpar camera and movement controls. As a designer, I know it can be easy to get caught up focusing on a couple of mechanics, making it impossible to notice other issues. Side note: Don’t believe me? Look at my game Captain Bitz. I was so focused on the mechanic of reflecting enemy attacks that I didn’t notice the glaring issue of all the enemies coming from only two spaces, both on the right side of the screen. This is one of the reasons why now I always get as much feedback as possible as early on as possible. Now here we can see a number of objects to interact with. That is, when the player approaches them. Moments ago, it was closed. I walked up to it and was easily able to open it due to the prompt appearing while slightly tilting the camera down. Now I am looking for a pair of boots, and I happen to notice them in the box. But there is no prompt. This led me to believe that these boots were for whatever reason unimportant. So I’ll continue on searching the rest of the cabin and not think much of it. After doing a lot of searching around, it seems like the boots are finally selectable. If you’re watching the video, you’ll notice a brief flash of the prompt when I look down after I’ve searched the room. The boots are now officially important and I should be able to select them. But I missed the prompt because I wasn’t looking at them at the time, because I was still under the impression that they are unimportant. Later, I begin to get frustrated and crank the camera all the way down into the box. Only then does the prompt appear for me. This is problematic because I was already under the impression that the boots were unimportant. I wasn’t looking for those boots specifically, and I have to crank the camera so far downward, to make the prompt appear, that they are incredibly easy to miss. But Scott, part of the fun is discovering these items to help you progress through the mystery. This is true! It is! The key terms are “discovering these items” and “progress through the mystery”. If you’ll turn your attention to the following clip, you’ll see my frustration at knowing where the boots are but not being able to bring them with me to check the size. This is all due to the information that the designers gave me leading me to think this pair was unimportant, alongside the camera control issue. What I’m getting at is, that as a designer, it is part of our job to try and anticipate what a player will be doing. Now it is impossible to anticipate everything a player does, like in Halo 2 flipping the tank in Zanzibar to exit the map and snipe players from a safe spot, but simple actions such as this shouldn’t be hard to miss. It could have been easily remedied by adding a cursor on the screen. Or maybe if the player pulled the left trigger it would show all the nearby prompts. Pulling the left trigger to see this could have saved me about 10 minutes of running in circles. Tapping on the right bumper gives Sherlock the ability to notice things that are particularly amiss, so this isn’t far out of the realm of possibility. The way they did it made me think they were attempting to have a similar feel as one of those I-Spy apps on iOS. The only issue being that in the I-Spy apps there is a stationary camera and a player just taps on the screen to activate the items. Here, due to the 3D camera, it is making it difficult for players to activate the objects they wish to. Sherlock Holmes Crimes and Punishments is a lot of fun, especially for someone like myself who loves a good mystery. Unfortunately, camera controls and prompts that only appear after the player has dismissed that option create an insanely frustrating experience. This is not to say that it is not enjoyable. If the player is willing to be patient with the game, they will find themselves in the middle of a mystery even Sherlock would be proud of. Thank you for joining me in this look into Sherlock Holmes Crimes and Punishments. As of this writing, it is free on Xbox One, and I think it is worth trying out. I hope with this post I got you thinking about the little actions in your games, like camera angles, and you’ll be able to catch them before the players do. Next week I’ll be updating you on my personal projects as I have selected one to really push forward with. P.S. For anyone who is interested or who wants to join the conversation while I stream these games, my twitch is http://www.twitch.tv/mrf1n3/. I usually stream a couple of nights a week, but I’m still setting up a permanent schedule. When I’m not streaming games for my blog posts, I might be streaming just for fun, namely Trials of Osiris or whatever other game I’m playing at the moment. I hope to see you there! It has been quite some time since I last wrote about Destiny. Today I wanted to discuss some of its end game content. Specifically, why Trials of Osiris is brilliant and what unexpected effects it has had on the community. Destiny has taken a lot of flack recently because of the few ways to gain the highest-level gear. The best way is the Raid Challenge modes, where players do a particularly difficult boss encounter a certain way to be rewarded with extra max level loot. But this doesn’t always last for players. The difficulty with having the end game content being against computers is that people can out smart them. There are endless strategy guides and how-tos, which walk the players through the entire raid. This makes it considerably easier to finish when they know exactly what is going to happen and when it is going to happen. Then there is Trials of Osiris. Trials came about in the House of Wolves Expansion pack (the second expansion pack) in early 2015. With it came one of the most difficult challenges in Destiny; getting to the Lighthouse. The way Trials works is the player must win nine games of Elimination against other players before losing three. If they do so, they will be rewarded with some pretty cool gear. But if the player makes it through the nine matches without losing any games, they have gone “Flawless” and get to travel to the Lighthouse. The Lighthouse is a kind of social area where only the best Destiny players have access. Side note: Elimination works via pitting two teams of three players against one another. Each player only has one life. Upon dying though, they can be revived by their teammates after a cool down timer. Every time a player dies, the cool down timer is extended. The team wins a round when all three members of the opposing team are dead simultaneously for three seconds. Teams need to win five rounds to successfully win the match. Once a team has reached three victories, the next round heavy ammo will spawn on the map in two locations, causing both teams to do a mad dash for the heavy that round. So why is Trials of Osiris so special? While computers act a certain way every single time, other players don’t. Trials pitting players against one another serves as an interesting experience because it is always different. There is no definitive “ This is how you do this and you will win”, because for any strategy your team might think up, the opposing team might think of a way to counter. Additionally, because this goes on for at least five rounds total, (the game can last a max of nine rounds if each team wins four) teams must change their strategy. Unlike the computer enemies in raids, humans learn and adapt. Trials are only available Friday-Monday, and each week is a different map. Players who are really good at one map won’t necessarily always have the advantage every week. It’s impossible to get really good at Trials without knowing all the maps. But even if the player doesn’t know the map, they have time throughout the weekend to learn it. What about the end game content? Well, we know that games get boring when players run out of goals to achieve. Whether that goal is to complete all the levels, or get that one piece of exotic gear, they need a carrot on a stick or they typically get bored. The Lighthouse is that carrot. And there is no easy way to get there. By pitting players against one another in a weekly competition, Bungie has taken a lot of the work out of having to create new content. Did I mention you are paired up against players who typically have the same amount of wins as you? So the game automatically scales in difficulty just based on player’s survival. They have successfully created gatekeepers to this legendary area out of the community. The other goal they have achieved with Trials is teamwork in PvP. All of the end game content in Destiny requires that players go in with teams. And players won’t be able to win without communicating. Due to the nature of elimination and the high stakes gameplay, the best teams are constantly communicating by calling out enemy locations to one another. This communication in turn brings people closer together, thus giving players more people to play with and ultimately Destiny retaining players. And now, for the ugly. When Trials originally came out teams would be paired up randomly against other teams as long as there was a good network connection. While this was nice because we didn’t have to worry so much about lag, players who are playing their first round could be paired against a vetted team, which has gone 7 and 0. This resulted, as you can imagine, in many unbalanced fights. In the most recent months, Bungie has been attempting to pair players in as fair matches as often as possible. This is why the matches now are based on how many victories teams have rather than connection. This resulted in a lot of bad connections and lag, especially in later fights as there were less teams to be paired up against. While they had the best intentions with pairing players based on wins against one another, it doesn’t help much when your team has been paired up against another team which has already gone flawless and has the ridiculously powerful Lighthouse weapons. So there is still an imbalance there. I feel as if non-flawless players shouldn’t be getting paired up in the first couple rounds against players who have already gone flawless. Sidenote: I feel as if it is important for me to mention these weapons do not make the players invincible. It’s just that no one else has access to them until they have gone flawless and that they are incredibly powerful. (I’m looking at you Doctrine of Passing (Adept)). Players can get a version of them at 7 wins but, from what I understand, the flawless versions don’t just look different, they also pack a meatier punch. Unfortunately, Trials of Osiris going flawless creates a bit of an Elitist mentality inside the community when discussing Destiny PvP. This mentality really hurts new players because players who have gone flawless will very rarely play with/ talk to players who have not gone flawless. Just take a look at Destiny’s LFG (Looking for Group) on the Bungie website. I'm pretty sure this is against Bungie's terms and conditions. This makes the barrier of entry an absolute nightmare for players who are getting into Trials. Sidenote: Due to Trials having such a high learning curve it is very difficult for players to get started. They can do the trials bounties (6 a week) which give them a % chance to recieve Trials gear but any Destiny player will agree, the random drops are useless more often than not. When playing at that level new players wont stand a chance until they have a team which can work incredibly well together and the gear to back them up. While this is an issue with the players playing the game (and not with the game itself), the players acting this way is a direct result of the difficulty of the game. Unfortunately, this community will turn off a considerable amount of players who will never get to experience this content because of it. Sidenote: The raid was no better when it first came out. But over time players have become more confident in their abilities and the LFG posts aren’t as bad. Whereas Trials has never let up, from what I’ve seen it just gets worse. Even though I don't blame them for not wanting the best of the best on their team (everyone does). There is very little in place to truely prepare players or to get advanced players to help out newer players. This is problimatic because in the rest of the high level content it seems like the most popular way to get through a tough section is to have a higher level guardian help out and teach newer players. Trials of Osiris is brilliant. Pitting players against one another for some of the best loot in the game really has made it much more difficult and rewarding when the player finally reaches the Lighthouse. This tension of the matches and how rewarding it feels to actually win is truly intoxicating. But the poor match making and the elitist community it is creating is making it difficult for a lot of players to experience this content. I hope this week I got you thinking about alternate ways to create end game content by simply changing the rules and using the community to your advantage. Also, I hope you thought at least a little bit about how difficult team events will effect the community. Thanks for sticking around. Rolling Sky is a goal runner. The player must navigate through a course while moving at a constant speed. They move their finger across the bottom of the screen to have the ball adjust its location along the x-axis. If the player makes it to the end of the track, they win. I was playing Rolling Sky this week and I noticed something in the second level. In the second level, you encounter these hammers which are swinging in a circle. They swing off the platforms and then back around to take up some space on a platform. If the player touches these hammers, they instantly die. The first one the player encounters swings inward when they pass it thus narrowing the path the player can travel on. Then the next three pairs of hammers swing outward when the player passes them. I found this to be peculiar because the other three then can’t actually have an effect on the player as they are swinging over nothing and the player would have already died if they had traveled over to that space. To clarify, this wasn’t the first time a player encountered these hammers. Upon reviewing the previous level, they were taught about them by the very first one encountered swinging outward then the next one swinging inward. So the player has time to learn how they function and prepare themselves for it. We know that typically in games when players are introduced to a new threat, they often have a chance to observe it and try to figure out how to tackle the threat. This can be in the form of scoping out a Dark Souls boss and dodging their attacks to learn their tells, or as simple as seeing some enemies attack something else in the distance. From that moment on, the players figure out how to take care of the problem. By solving the problem, they are able to refine their methods and become more skilled at fighting this type of enemy or completing this type of task. But in our case, the hammers are harmless. The ones that swing out have no effect on the difficulty of the game. That is of course unless the Designers intended to use them as a tactic to make the player freak out or distract them. This could be their goal; by psyching the player out, they have surely ensured their doom. We see something similar to this throughout these levels as well with the falling platforms. The vast majority of these have no purpose, aside from making a cool ping noise to go with the music, since the player is moving at a constant rate and unable to stay on them for long enough for them to fall anyways. But interestingly enough, we see larger platforms later on that can actually let the player fall. Here we can see the player touching the platform and the larger platform falling away, creating obstacles in the future which the player may not have accounted for. The falling platforms fall into the realm of standard game design by showing the player how to deal with something before introducing them to actual danger. The hammers changing back and forth give us an interesting conundrum. Could going slightly against the standard rules of game design be used to throw off players? I believe so. Because there are so many excellent games out there that teach players how to think and solve problems in games, this could be an interesting idea to make a game feel fresh, although it can be difficult to implement. While the developers of Rolling Sky used this expertly, the rules of design are standard because they work. Side note: I’d like to take a second to talk about the controls. Because the object the player is controlling is a ball, this could have gone a thousand different awful ways. (Tilt controls GAH!!!) But because the ball is tethered to the location of the player’s finger, it makes for an excellent experience navigating around tight corners. Thank you for joining me in this exploration of the illusion of danger. I hope this week I got you thinking about ways you can break the rules in your games to make your games feel fresher.